Rust removal on a classic Ford Mustang or other classic car is almost always one of the first things needed to be done. Removing rust can start with paint stripping, sand blasting or grinding. And if the rust is substantial, will probably involve cutting out panels or affected areas. The picture shows a combination of ways to get rid of the rust. 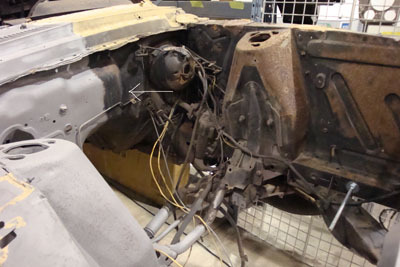 On the right, parts of the engine compartment have been stripped of rust spots and paint with a grinder. While the process works well on large flat surfaces, it doesn't do a great job in small areas and uneven parts. The left side of the picture shows the results of sandblasting or media blasting. Sandblasting and media blasting can get into all the small areas a sander or grinder can never hope to reach. It leaves a dull surface, that looks similar to gray primer. The type of abrasive material and it's hardness can make a difference as to what needs to be done after the fact to get the steel surfaces ready for refinishing or body work. Here's a common list of tools and equipment you'll need to get the job done. While the above list will for the most part get the job done, there are a number of optional pieces of equipment and supplies you may have or want to buy or rent to speed up the process. During the rust removal process, you may be surprised to find areas you thought were solid, turning out to be full of small holes. When you see them, it doesn't just mean repairing the holes, it means a large area around them is probably paper thin and will need to be cut out and replaced with new metal. The next sections get into more detail, using these different methods. You'll find links to these sections below. In part 2, we're going to use a Grinder or a Drill and some of the different types of discs available to get the rusty surfaces back to metal. Over the years, sandblasting has evolved into using different types of materials to prepare surfaces. Part 3 covers the alternatives. This section looks at what you need to get the job done. We'll also work with some of the cheaper alternatives in the Sand blasting including their advantages, disadvantages and how to use them.